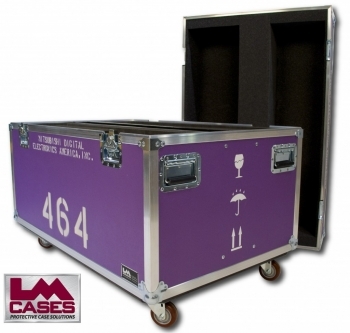 This case was built for Mitsubishi Digital Electronics of America, the case is designed to hold monitors used in Mitsubishi's trade show booths. 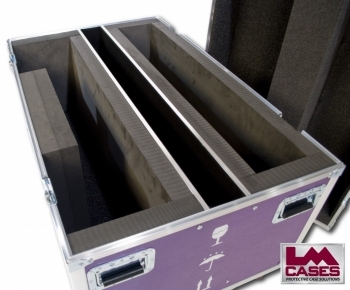 The case holds 2 VS-L46XM70U monitors on BR-XM70KK mounts. The interior of the case is completely lined with crosslink foam, which is a Class A surface to prevent scratching the monitors. The case is built out of LM's proprietary composite panels laminated with purple ABS, the exterior of the case features 3.5" Colson Poly Hi-Tech casters, 8 handles, international shipping silkscreens, a stencil of the companies name as well as a large stencil of the individual case number. 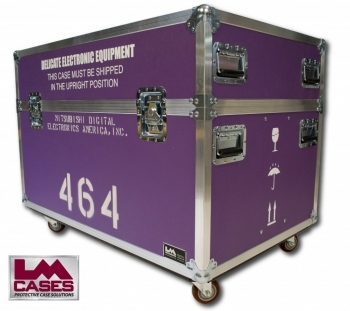 Special thanks to Mitsubishi Digital Electronics of America!